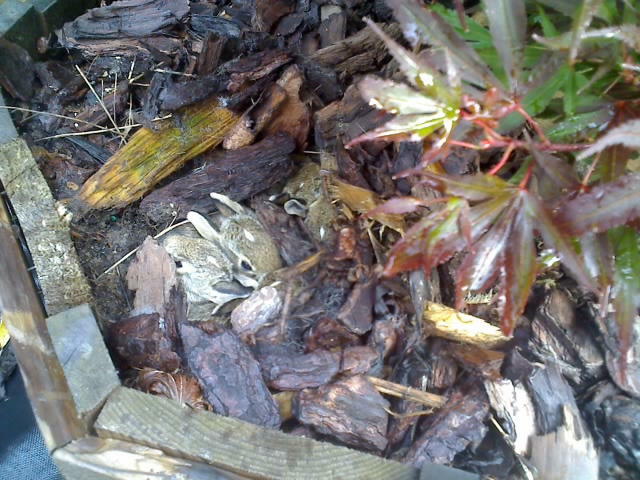 As I was watering plants a few weeks ago, I was startled by movement under the bark in one of the container boxed maples. I didn’t want to move in too quick unless it was something that would jump out at me like a rat. As I moved closer, I noticed the fur looked like rabbit fur and sure enough, there under the bark were five little baby bunnies. They were so cute. I try to keep bunnies out of the maples because they just love to chew them. My mother wants them out of the gardens because they chew everything they find especially her favorite, oriental and asiatic lilies, in which she anticipates seeing them every year. This year, she had quite a time keeping the rabbits away from them. Anyways, I couldn’t kill the bunnies, how could I. I can’t even kill a spider that lives in the house. I have to move it outside. The bunnies are adorable. I’ll let them grow up. Now, they are bouncing around through the containers and in the gardens. I probably will regret it later but I can’t help myself when it comes to animals or insects. They have their own life just like humans. It is just a different life than ours. Humans keep pushing the animals away…….They have to live somewhere………So, if they come here, they are very welcome. Spring is fast approaching and most of the snow has melted. That gave me a great opportunity to walk around the fields in the nursery to see how the plants weathered during the winter months.Ugh! Much to my amazement, I was devastated by what I had seen. This has never happened to anything in the nursery for the 19 yrs that I have been growing in the fields. Voles have devoured the Japanese maple trees along with some Grand firs. There are about 50 trees that have to be taken out. These maples have been growing in the field since 2000. There is nothing that can be done. I have to just grin and bear it and continue to make more. Just that it will be years before they get to that size again. The other situation I came across was the damage to the newly planted maples in the Aceratum that I am creating on 3 acres. There is one spot through the area that has very sandy soil. The maples through this vein of soil have had their trunks burned by the wind. You will note on the photo about 8-10 inches up from the base a black color. That is the burned cambium layer of the trunk. The energy will not be able to go to the top of the tree because of this. There are about 6 trees that have completely died and about 10 that look iffy. This occurred at the end of February when the snow had melted and the winds were blowing at 45 mph with a temperature of 20 degrees. Making the windchill below 0. This lasted for 3 days. If it was for one day, the maples would have had a chance but it was too cold for too long. Another bummer, luckily I do have copies of these maples that have died in containers in the cold storage buildings. They are not as large but at least I still have the variety. Which brings me to my last brush with mother nature. I have 4 storage buildings and the maples are stacked in on top of each other. Every year, I have to put a rodenticide down to keep the mice from chewing and eating the trees during the winter months. Back in late February, I noticed that the rodenticide was gone. In three buildings I put some more down and the last building, I decided to put it down on the next day. I went in the next day and damage was already done. The mice had breakfast that morning on the new 2008 grafts that were to be put on the online store. They had made stubs out of about 25 plants and chewed the understock on some of the high grafted dissectums scarring them. I will have to watch the scarred maples grow and heal in the maple hospital for a year or two. It never fails that the maples that the critters like to chew on are ones that are very rare and that I don’t have a lot of. You can see the path they make to get to the rarest maples there are. I think the various varieties must smell or taste different to them. Now, I just have to make more but it will take another year or two to get numbers up again on some of the varieties. I don’t blame the critters for eating. They were hungry and I neglected to put out the rodenticide. I also have deer damage in the fields. That doesn’t seem to bother me. I have a couple fields of yews that they love to browse on. I leave that for the deer. Since I let them browse on the yews, they don’t seem to bother the maples or other plants that are growing in the nursery. If they do browse on other items, I just consider it as selective pruning. I have a lot of work to do this spring in the nursery. 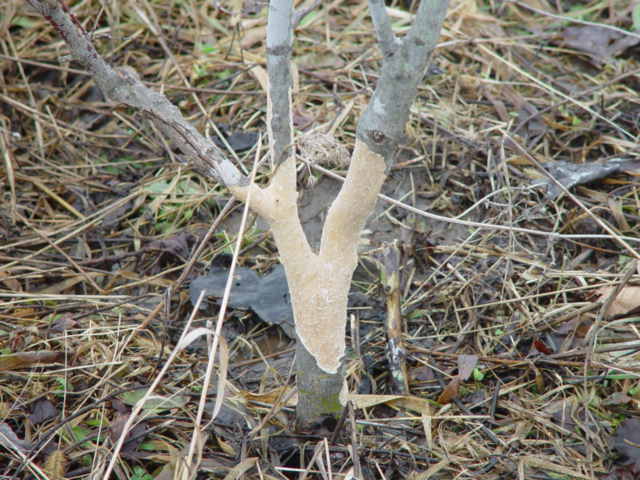 Remove dead trees from the Aceratum, take out damaged trees from the field and make more grafted maples. I planned on doing about 2000 grafts this year. Maybe now, I should do more. It is always a live-and-learn experience when mother nature is involved. You can’t get upset when something happens to your plants because of nature. It is a part of working with it. You never know what might happen. Stanley and sons has officially named there seedling maple that was previously known as ‘Unknown’ to ‘Jewels’ in honor of their new daughter-in-law and Steven’s wife Julie Meloy. She is known as ‘Jewels’ in e-mails and text messages. For all of you that have purchased the maple as ‘Unknown’, please at some point, change the tag so that ‘Jewels’ is not confused as being a new variety. ‘Jewels’ was founded 20 years ago as a seedling in their understock. It is a nice rounded shaped maple similar to a hime type. You can check the website for a new photo of the maple which is a photo of the original stock plant at Stanley’s.